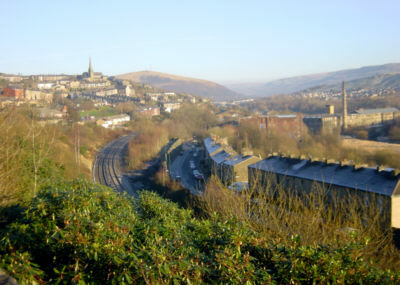 The area of Mossley around Mossley Station, Manchester Road and Bottoms is known locally as "Bottom Mossley". 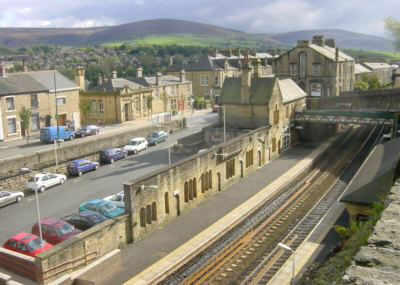 Mossley Railway Station, seen from Stamford Road, with Manchester Road running alongside. Looking north along the railway line and Manchester Road, Mossley, towards Woodend, Roughtown and Uppermill. 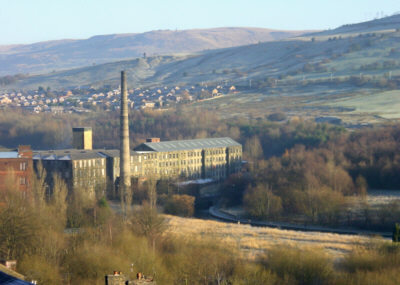 Woodend Mill, Mossley, showing the Huddersfield Narrow Canal in the foreground and Hey Farm Estate behind. 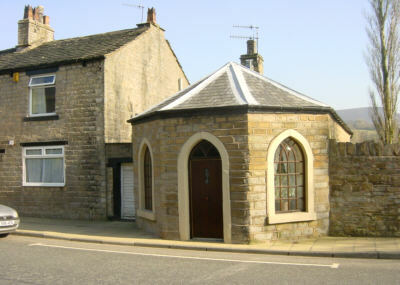 Former toll gate keeper's cottage on Manchester Road, Mossley. The road was first built by a private turnpike trust who charged tolls for users of the road. A gate or bar blocked the road, which was opened on payment of the toll. The toll gate keeper would live in the cottage to be available throughout the day.